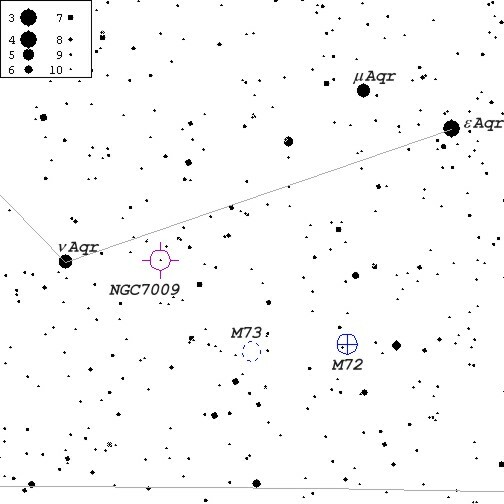 This bright planetary nebula can be found in binoculars as a faint "star" close to M72 globular cluster and M73 asterism, just 1°20' W of n Aquarii (see finder chart below). Its elongated bluish disk is visible even in small scopes but faint Saturn ring-like projection recquire 8 inch. aperture and and high magnification to be noticed. The image above was taken on October 23, 2000 from Harrowsmith, Ontario. It was a very clear and calm night with some auroral activity. Target was very low over SW horizon. Cookbook 245 LDC camera was used on Celestron Ultima 8 SCT with eyepiece projection to achieve f20. White (13 x 30 sec.) 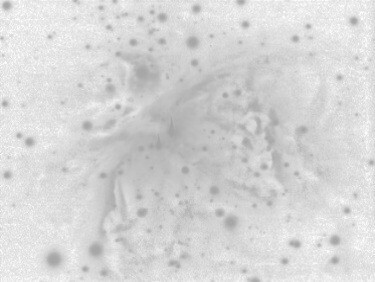 exposures were combined with cyan, magenta and yellow-filtered images (3 x 30 sec. each) using AIP4WIN software and the image was furter adjusted using Lab color space with Corel PhotoPaint 8. Only a quater of the original Cookbook frame is shown. North is up.